The other day while browsing some topics on waves, I came across some pretty pictures. These are nice, aren't they? Did you know that they are drawn by a computer? It used some simple mathematics that create the curves! These particular curves are called Lissajous curves in mathematics. How did people discover the mathematics of these curves? Why? And what's their use? Lissajous curves are named so after the French scientist Lissajous, who discovered them. He had built a machine to study sound waves. He would fix one mirror on the thing that was making sound. He would reflect a beam of light from it on to another mirror. This second mirror was attached to another vibrating object. When the mirrors vibrated, the light reflected from them fell on different points on a screen that he watched. But why two mirrors? Well, sound vibrates really fast - more than what our eye can catch. A fast moving light point appears like a straight line. Its like the blur of fan blades. To see a pattern, he had to move the beam in the perpendicular direction as well. When the second mirror vibrated in a direction perpendicular to the first one, the light beam appeared like a graph on the screen! There was another curious thing. Depending on how fast the second mirror was vibrating compared to the first one, the light would trace different interesting shapes. He then went about studying the mathematics behind it and discovered these curves. 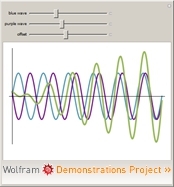 You can also make a Lissajous curve by making a graph (plot) from two waves. Place two waves side by side. To mark a point on the graph, choose two values, one from each wave, and use them for the point coordinate. 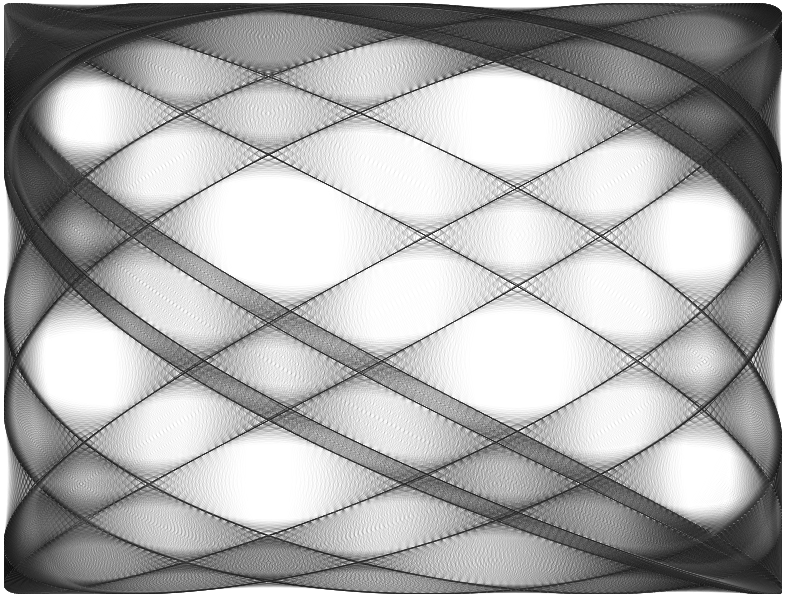 Lissajous curve is the result of two waves that are perpendicular to each other. You can use the demonstration below to play around with Lissajous curves (needs Java). Change the sliders and see how the waves and the curves change. 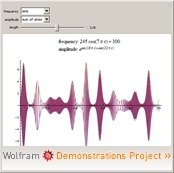 There are some well known Lissajous shapes that are used when comparing waves. The ratio between "Wave 1" and "Wave 2" determines the shape. Pause the animation above (pause button on botton left corner) and try the steps below. Set sliders "Wave 1" and "Wave 2" to minimum. Change the "Shift Amount". Do you see some known figures like straight lines, circles and elipses? For each of the steps below, start with "Shift Amount" at zero. And then change it to see how the figure appears to rotate. Increase "Wave 2" by one step. Increase "Wave 1" by two steps. Increase "Wave 2" by two steps. Lissajous curves are used today in oscilloscopes, a kind of instrument that is used to study electrical waves. You usually find them in electronics and science labs. It is also used in space travel! Spacecrafts often follow an orbit that resembles a Lissajous curve. And have you watched laser shows? These are also used in laser shows to create beautiful patterns. And in computer graphics to create wonderful shapes and diagrams. Below is another demo for you to play around with. Change the sliders to get different effects. Take some time to explore the mathematical equations if you understand it and are interested! 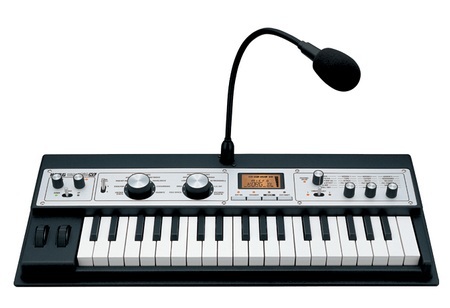 Music Synthesizer: How can it play so many instruments? How does a music synthesizer create sounds of so many different instruments? Some can even play a dog barking, or a helicopter flying. Do you think the sounds are recorded inside and played back? That is simple to imagine, but is actually very cumbersome to make. How it does it is much less tedious, but a lot more amazing. Our ears recognize repeated disturbances in the air as sounds. Disturbance is nothing but a change in pressure, imagine pressing and releasing a spring. A single press or a soft press and release will just be change in pressure - the kind you feel when in an aircraft. When you release the pressure suddenly and let it vibrate is when you create repeated disturbances. This repeated vibration can be detected by our ears as sound. How fast or slow they vibrate can also be detected and it is called the frequency or tone. Sound waves as change of air pressure. The sound produced from instruments have another property called harmonics. When an instrument tries to make sound of one frequency, it is usually mixed with sounds with many other smaller frequencies. These are at frequencies that are factors of the frequency it is trying to create. It gets even more complex from here. The way different instruments produce their sound leaves its mark on the sound. The way the sound starts, ends, the way the strength of sound varies, and so many other things. These are what make each instrument unique! Record and analyze the sounds produced by instruments. Try and break it up into as many simpler parts as possible. Mathematics is one thing that is used heavily here. Create each of the parts using computers and electronics. Mix them and fine tune them with some more wizardry to get the final sound. Something similar to what you did if you tried the demonstrations above, only much more involved! 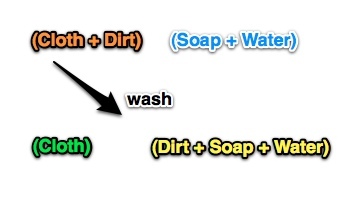 Below is how a simple string sound is synthesized. Click on each of the sounds below to play. It's amazing how the simple tones gradually change to sound like an instrument! Step 2: The waves and modified using something called "pulse width modulation"
I'm sure you must have seen this. 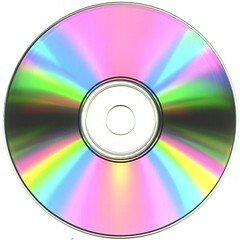 When you take the shiny surface of a CD or DVD and tilt it towards light, you see streaks of colors across its surface. The colors change as we move the CD around in the light. Have you ever seen light? Light helps us see, but we can't see light itself! Early scientists used to believe that light is a stream of small particles (objects). However later they realized through many interesting experiments that light can be like wave too! Waves like what we see on water. Light is a wave of energy. Actually the colorless light that we see is composed of a mix of many colored lights. The way one color is different from another is by the length of the waves - the distance between two peaks of a wave. White light consists of all color waves mixed together. Because light is a combination of waves like we just realized, when two light waves come together, some interesting things happen! If the two light waves are exactly in step with each other, the resulting light is just like the ones before, just stronger (brighter). However if the waves are exactly out of step with each other, they cancel each other out and we get darkness! Can you now imagine what will happen if they are a bit out of step, but not fully? They form a new wave! You can imagine this by visualizing one color of light getting completely cancelled, leaving the remaining colors intact. This new light wave is actually that of a new color! It is not white, it can be any mixture of any of the colors that white light is made of. Mixing waves either adds up, cancels or forms completely different waves. That's interesting! You say. But how do you get two light rays slightly out of step like this on a CD? A CD has very fine spiral grooves on which information is recorded. The grooves are so fine that only a beam of laser light can be used to read it! The grooves are actually almost as near to each other as the wave length of light - about 780 micro meters. So when two nearby grooves reflect light, they are just a little bit out of step. If they are coming in the same direction, they mix together to show us different colors! Soap bubbles and oil spread on water also show colors. How does it happen there? Did you know that similar technique is used to produce holographic images? Can you guess how? What experiments did scientists do to figure out that light can be a wave? Few days back I saw this in a garden. You know what these are, don't you? These are butterfly eggs. And you know what will come out when it hatches. A caterpillar! And then the caterpillar forms a cocoon and after some time out comes a pretty butterfly. 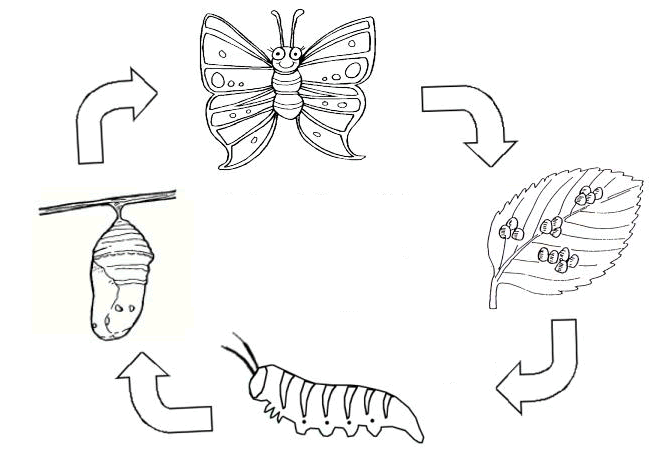 We all know the life cycle of a butterfly. It is special because after each step a completely different life form emerges, very different from the previous step. It is also called "metamorphosis". A complicated sounding name, to match the complicated process. But why does a butterfly egg hatch on to a caterpillar in the first place? Why does it not hatch directly into a butterfly? It indeed is a big question. But let's try and understand it in a simple way. Forming a new life is complex affair. Nothing gets created out of thin air, it takes lots of energy. Creating bigger things take even bigger amounts of energies. So to keep things easy, life starts small. 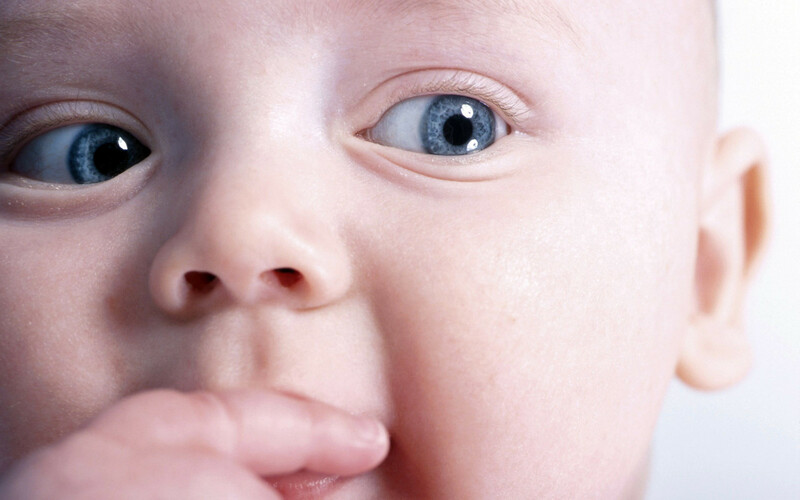 The energy and nutrition required to create this small new life can be capsuled easily. Eggs, seeds, fruits are all examples of this. After this small new life gets born, it eats food to grow into an adult. We are familiar with this. Even we ourselves are born small and grow to become adults. Butterflies are little different because they lay many many eggs. Since the energy and nutrients get divided among the eggs, each egg gets only a small portion of it. So the butterfly eggs have been designed to be very simple. They use the small amount of energy with them to hatch out a simple life form - the caterpillar. This simple caterpillar is designed to do just one thing - eat. It eats and eats till it becomes fat and large and has enough energy to create the final butterfly form. It then forms a cocoon around itself - a sort of an egg that it creates for itself. All the energy it had absorbed are now used to change itself into a far more complex life form - the butterfly! Why do some insects lay many many eggs? 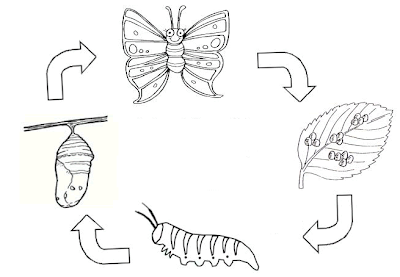 Why don't animals go through metamorphosis as well? Why is a cocoon required? 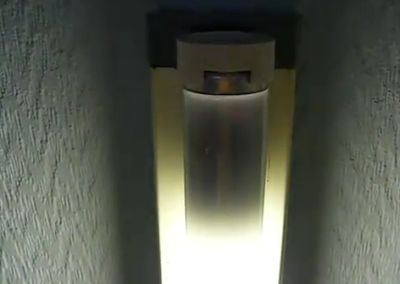 Fluorescent lamps sometimes have these dark rings. They usually form around the edges. Lamps usually go bad after they get these dark rings. What are they? Why do they form? Why are they bad? Let's first see how a fluorescent lamp works. It works by converting energy from electricity to light. To do this, it uses some special gases inside the tube. So how do the gases do it? 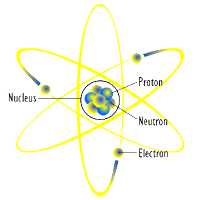 The gases, or for that matter anything in this world, is made up of tiny things called atoms. 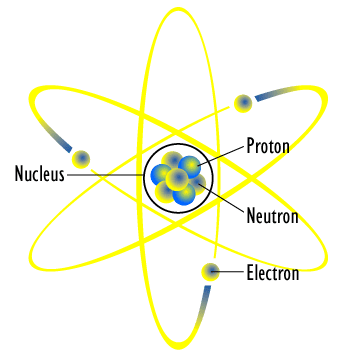 Inside atoms there are even smaller things called electrons, they can't be seen, only imagined. It is possible to excite the electrons by giving them energy. What do they do when excited? They jump around inside the atom! When they are very excited, they can even fly out of the atom and hit another atom. Ok... but then so what? You ask. 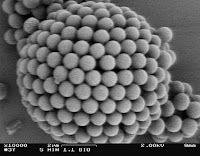 Atoms seen under microscope (left). Well, that's where the magic happens! You see, the electrons eat up the energy you give them, like heat or electricity, and then they dance around. While dancing around, they give out the energy they absorbed, but this time in the form of light. So, with all their dancing and jumping, they are actually helping us convert electricity to light! Aha! But then, what about those dark rings? 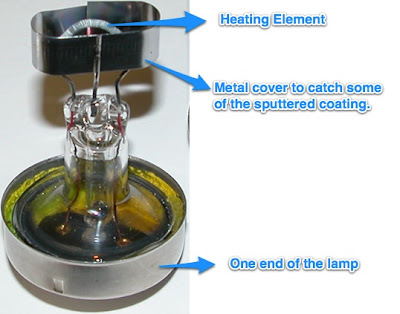 Ok… So here's what is there inside the lamp. The lamp is filled with a special gas. On each of the ends of the tube are metal conductors. They are called electrodes. They also have small heaters to heat them up. And they are coated with a special material whose electrons get easily excited through heat. We apply electricity to these electrodes on each of the ends which also heats them up. The electrons of the electrodes get excited. They jump around, hit their nearby atoms, which are the gas atoms. The gas atoms get excited and excite their nearby gas atoms. So on and so forth, till all atoms inside the tube get excited and start jumping and flying around, giving us light. But everything's not hunky dory everywhere. Remember the special coating on the electrodes? All these jumping and flying electrons around the heated electrodes, slowly wears it out. It's called sputtering. You can imagine how oil sputters on a pan or water boils into steam. Similarly, the coating slowly comes off the electrodes. The sputtered coating gets deposited on nearby things, in this case the glass cover. That's how the glass gets the dark marks near its ends. Are the rings bad for the lamp? Yes… When most of the coating wears out, the electrodes can no longer excite enough atoms. A worn out electrode can even break. When that happens, the gas atoms can not get excited enough. And then the lamp won't light up any more. This happens normally with age. But it can happen more if the light fixture is faulty. Why are the lamps coated white? Hint: Why are they called 'fluorescent' lamps? Why do some lamps flicker before switching on? More about this on the 'What's wownder' page.